October 20, 2006 is an important date of all Centipede children and friends. 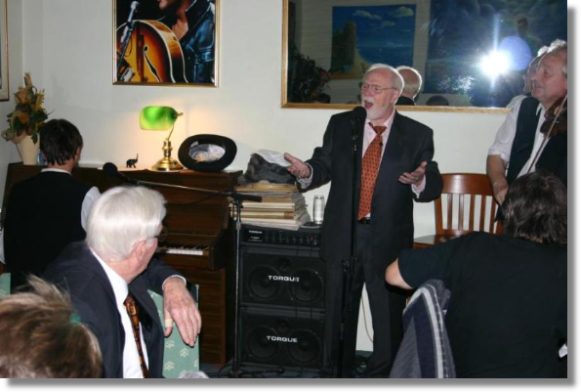 This day, Mr. Arne Bendiksen, a well-known Norwegian composer, author of the Centipede anthem „Never Be Alone“ and a huge Centipede friend celebrated his 80th birthday. At this occasion Mr. Bendiksen and his wife together with many Norwegian friends came to Czech Republic to celebrate his anniversary with his Czech friends. First day of the celebrations took place in representative halls of the Educational centre of the Ministry of Defence in Komorní Hrádek. Our guest was welcomed by Col. Pavel Voburka, who congratulated him in the name of the Czech Army, and handed over the commemorative medal of the General Staff of the Czech Army. To commemorate this day, a honorary medal of Komorni Hradek was handed over to Mr. Bendiksen. On Saturday, October 21, Mr. Bendiksen met the Czech friends for a dinner. After many congratulations there was a surprise waiting for him. In these days the preparations for a professional performance of the Czech version of the “Centipede” musical Never Be Alone started. The children from the Disman choir will perform in this musical. The Czech translation was done by a renowned Czech translator PhDr. Jiri Josek, who announced this special news to Mr. Bendiksen, as his personal birthday gift. During the evening, Mr. Bendiksen sang some songs from the musical, which are popular not only in Norway. The mood was excellent and everybody was sorry that the evening was over.